Our hand-fed range wood burners are ideal for making use of on-site generated wood offcut waste. They are all approved appliances for use within smoke control areas whilst combusting MDF, chipboard, softwood and hardwoods. 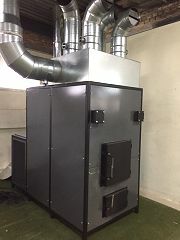 Easy to operate, they are a simple solution for factory space heating and wood waste disposal. We manufacture a wide range of burners to suit all business sizes, from a small workshop up to large premises. Contact us for advice on what size is best for you.